Don Tracy Glass specializes in serving the northeast Oklahoma area. However, we travel all over Oklahoma and even in the surrounding states for major projects. Call us today to find out if we travel to your location. Don Tracy Glass Company is a family-owned and family-operated business but we are anything BUT what most people would consider a "Mom & Pop" glass shop with few options or choices. Although we provide a large variety of glass products and services, we specialize in customer service and ensuring our customers' input and ideas are considered and incorporated in the job we do. We enjoy helping customers with house remodeling projects which include mirrors, shower doors, cabinet door glass, new insulated glass units, furniture top glass and a large number of other glass products. 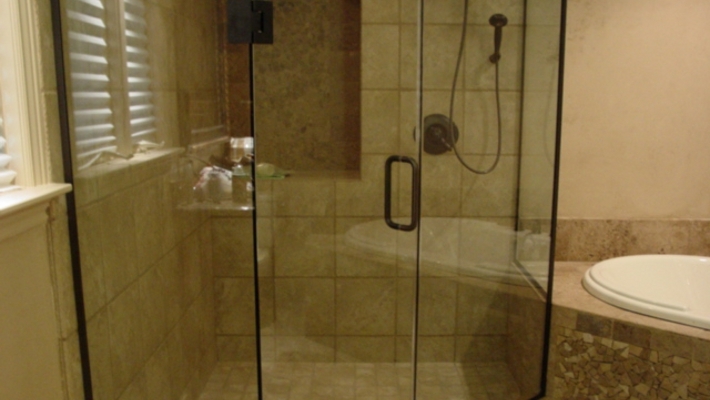 Be sure to visit the "SHOWER DOOR" section to gain more insight and knowledge of our frameless shower doors. Don Tracy Glass wants to be the place you go for all your glass needs. Have a broken window? We are still in the business of repairing those single-pane, putty-glazed windows in older homes. We also provide insulated glass units for newer windows so that you do not have to purchase all new windows; just let us change out the failed insulated glass (IG) units. Want to protect your new or aging pieces of furniture? A glass top will provide protection as well as provide a clear view of your beautiful furniture. Want to hide some scratches in your furniture tops? We can provide bronze or gray glass that will help minimize those ugly scratches. If you want to make a small room look more open and bright, mirrors will do the trick. Whether you want wall-to-wall and floor-to-ceiling mirrors or just a portion of the wall or a mirror over a vanity, we can provide a custom-fit for your home. Need an electric receptacle or a light fixture coming through your mirror? No problem; we can drill holes to accommodate your light fixtures or other custom needs. Framed mirrors are becoming more popular. Bring your favorite frame in to Don Tracy Glass and we will place a beveled or plain edge mirror to custom fit in your frame. If you have updated your kitchen to include cabinet doors with an open panel, we have several glass patterns that can be installed. You can choose whether you want to see everything, a little, a lot or next-to-nothing in your cabinets depending on the glass you choose. We have two kinds of seedy glass as well as German Antique IN STOCK and we can get most other patterns of glass within a few business days. Come in and check out our large selection of glass appropriate for cabinet doors. Copyright © 2019 Don Tracy Glass. All Rights Reserved.